As the old saying goes, you don't put all your eggs in one basket; diversify your investments. Harmoney uses a 'fractionalisation’ model to enable Lenders to diversify their investment across hundreds, if not thousands of loans. In fact, 100% of Lenders who have invested in 100+ loans have a positive return. The Harmoney model ‘fractionalises’ (splits) personal loans into chunks of $25 that we call ‘notes’. This fractionalisation protects Lenders by enabling you to diversify across hundreds, if not thousands of personal loans, and reduce the exposure (and risk) of a single investment. Rather than lending $500 to one individual Borrower, you can lend $25 to 20 different Borrowers. By lending to multiple Borrowers, you are reducing the risk associated with only one investment - in other words, you're spreading your eggs over lots of baskets. This graph demonstrates how greater diversification (through fractionalisation), can reduce the volatility of your Realised Annual Return (RAR). 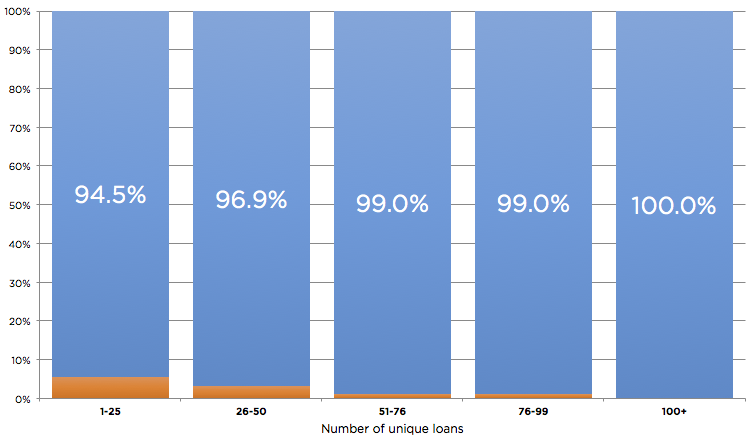 Moving from left to right, as the number of personal loans per account increases, the Lenders' RAR trends towards the platform average. You will also see that once a Lender passes 200 personal loans loans in their portfolio, the volatility significantly decreases, i.e. a diverse portfolio of $5,000 (200 loans x $25 = $5000) offers a Lender much more stable returns than a portfolio with a lower investment. Harmoney Lenders with a more diversified portfolio typically experience less volatility and more solid returns. This chart shows that Lenders who have diversified their portfolios – those who have spread their risk over a higher spread of personal loans – are more likely to have positive Realised Annual Return (RAR). In fact 100% Harmoney Lender who has diversified across 100 personal loans or more is receiving a positive RAR. Taking advantage of the option to fractionalise your investment spreads your exposure to risk, but also allows you to diversify your investment across numerous credit grades.